This is Eastern Market, where for more than a century farm products have drawn shoppers from the neighborhood and around the city. 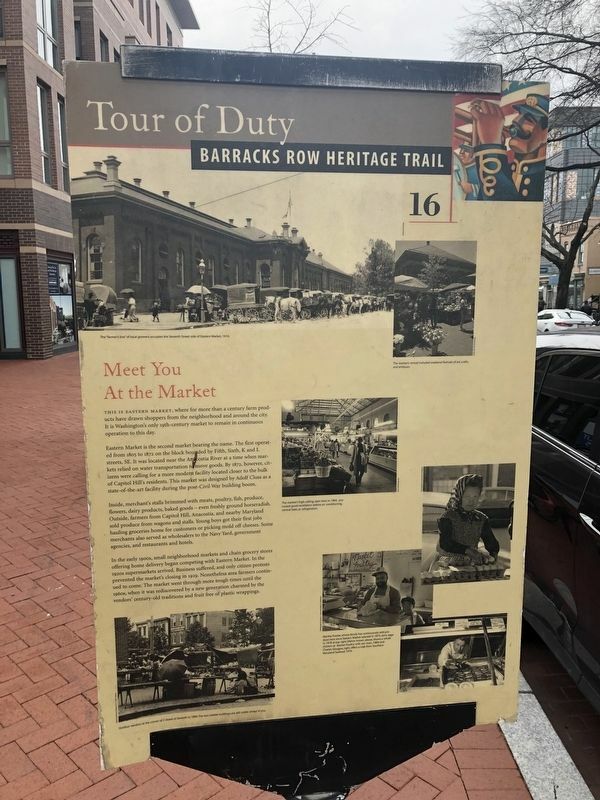 It is Washington's only 19th-century market to remain in continuous operation to this day. Eastern Market is the second market bearing the name. The first operated from 1805 to 1872 on the block bounded by Fifth, Sixth, K and L streets, SE. It was located near the Anacostia River at a time when markets relied on water transportation to move goods. By 1872, however, citizens were calling for a more modern facility located closer to the bulk of Capitol Hill's residents. This market was designed by Adolf Cluss as a state-of-the-art facility during the post-Civil War building boom. agencies, and restaurants and hotels. 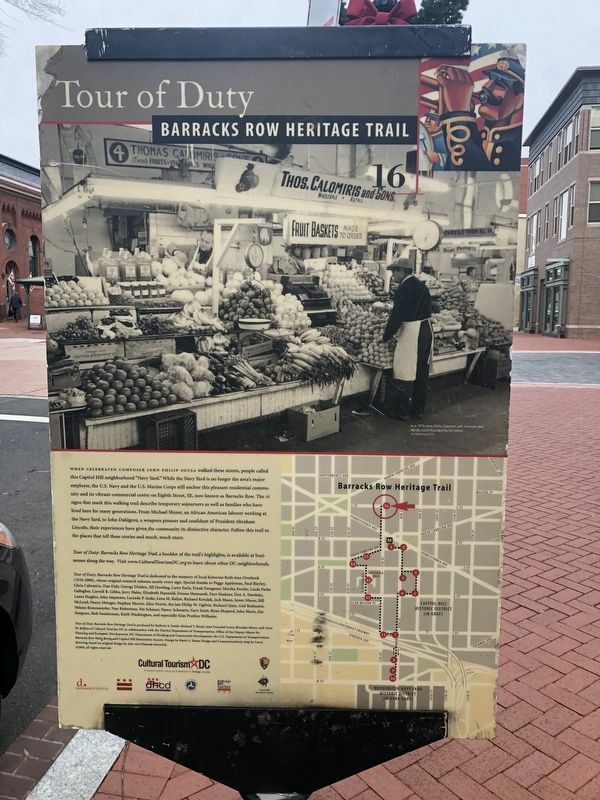 In the early 1900s, small neighborhood and chain grocery stores offering home delivery began competing with Eastern Market. In the 1920s supermarkets arrived. Business suffered, and only citizens protest prevented the market's closing in 1929. Nonetheless area farmers continued to come. The market went through more tough times until the 1960s, when it was rediscovered by a new generation charmed by vendors' century-old traditions and fruit free of plastic wrappings. Location. 38° 53.155′ N, 76° 59.765′ W. Marker is in Capitol Hill, District of Columbia, in Washington. Marker is at the intersection of 7th Street Southeast and C Street Southeast on 7th Street Southeast. Touch for map. Marker is at or near this postal address: 310 7th Street Southeast, Washington DC 20003, United States of America. Touch for directions. away); Commerce and Community (approx. ¼ mile away); Life on the Park (approx. ¼ mile away); Ebenezer United Methodist Church (approx. ¼ mile away); Healing the Wounded (approx. ¼ mile away). Touch for a list and map of all markers in Capitol Hill. More. Search the internet for Meet You At the Market. Credits. This page was last revised on March 21, 2019. This page originally submitted on January 4, 2019, by Devry Becker Jones of Washington, District of Columbia. This page has been viewed 46 times since then. Last updated on March 7, 2019, by Devry Becker Jones of Washington, District of Columbia. 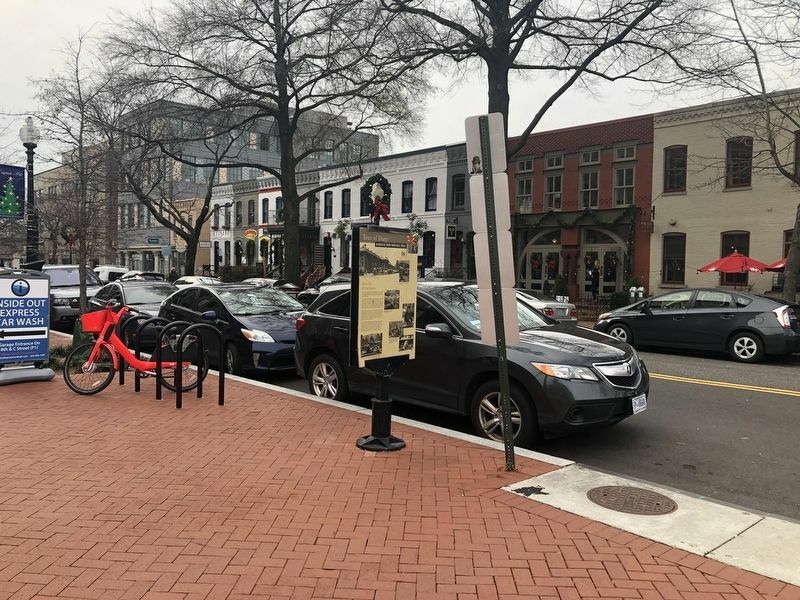 Photos: 1, 2, 3. submitted on January 4, 2019, by Devry Becker Jones of Washington, District of Columbia. • Bill Pfingsten was the editor who published this page.